Book Norway Ferries with Fjord Line - Bergen, Stavanger, Kristiansand and More! You can use AFerry to book a Fjord Line ferry in Norway to the towns of Bergen, Stavanger, kristiansand and also to Hirtshals on the Island of Vendsyssel-Thy. You will find Fjord Line ferries offer top levels of comfort and a full range of on board facilities whether you use their fast catamaran on the Hirtshals - Kristiansand routes or their standard ferry on their Hirtshals - Stavanger - Bergen routes. AFerry.co.uk always has cheap prices for Fjord Line and the latest special offers. See below for the latest Fjord Line ferries prices and sailing times. Click on your ferry route for a detailed Fjord Line timetable. Fjord Line has two ships on their routes, the MS Bergensfjord and one of the world's fastest ships - the fast catamaran the Fjord Line Express. On board both ships you will find a full range of facilities. On this route you will travel on the MS Bergensfjord where you will find a full range of facilities and accomodation. You can book Economy Class cabins, Standard Class Cabins, Comfort Class cabins, or for a taste of luxury, Fjord Class cabins which have a TV, mini bar and excellent ocean view. You can also book airport style seats which are the least expensive option and can be adjusted to help you sleep. However, we reccomend you bring your own pillow and blanket. On board, you will also find a buffet restaurant with hot and cold dishes, an Italian restaraunt and also a cafe serving hot and cold drinks and snacks. In the summer months you will also find a bar on deck where you can admire the view and soaking up some sunshine. There is also a night club on board where a house band plays every night and the bartenders really know their cocktails! On this route you will travel on the catamaran the Fjord Line Express which is a very fast ship. In fact, it holds the world record for the fastest crossing of the Atlantic. Don't worry though because you reach these extremely high speeds on your journey. Included in the price of your ticket are comfortable aeroplane style seats. On board there is also a buffet restaurant serving different menus for breakfast, lunch and dinner in addition to a salad bar and dessert table where you can treat yourself to a few sweet Norwegian delicacies. Any journey with this excellent Norwegian company is bound to be a very relaxing and enjoyable experience. 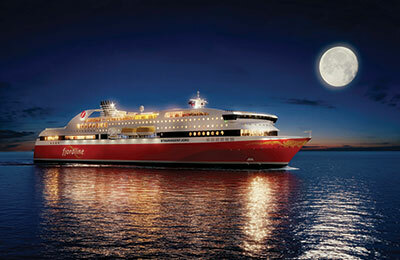 Book your ferry for Norway simply and easily with AFerry. How long before departure should I arrive for FjordLine? Bergen/Stavanger/Langesund - Hirtshals: Passengers departing from Bergen or Stavanger must check in at least 60 minutes before departure. Passengers departing from Hitshals must check in at least 90 minutes before departure. Check-in closes 20 minutes before departure. Kristiansand - Hirtshals : Passengers must check in at least 60 minutes before departure. Check-in closes 20 minutes before departure. Fjord Line reserve the right to reject passengers arriving at a check-in counter after the specified check-in deadline. 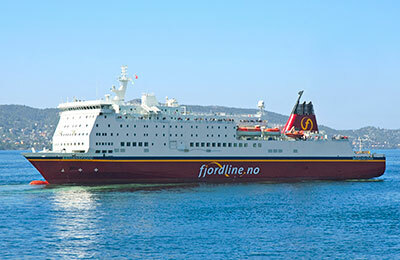 Fjord Line gives no refund for paid tickets for passengers not complying to the specified check-in times. On our way home we didn't drive through Germany, Denmark and Sweden like on the start of our vacation, we took the ferry. The only thing I didn't like was that the cars started to move after more than 30 minutes after the ferry landed in Hirtshals. Apart from that, I'd recommend it. I was told I could not travel on the same ship as our friends because I was to high I would be booked on the freight ferry Well they only just managed to get me on because I was just able to get on because the roof was to low our friends ferry was full of wagons with 4.5 meter trailers. We thought that we could be left on the dock but some shop staff came and we were backed on at the back and they could just get the doors closed a very worrying time.